When I go to a restaurant that specializes in primarily one thing (one dish or cuisine), I expect that thing to be pretty good since the eatery can devote all their efforts into putting out a tasty food item. -If you say you serve traditional cuisine and deliver something that does not even remotely resemble authentic cuisine, that’s not good. Why is the soup so paramount in my books? Simple, everything sits in the soup. The soup often is the one component that packs the biggest flavour punch in a noodle in soup dishes. With noodles that are bland (think rice vermicelli & udon) the soup act as a flavour enhancer. The noodles inevitably soak up the flavours of the soup, yielding a more tasty bite. -and if I don’t fell super sick from MSG overload hours later. 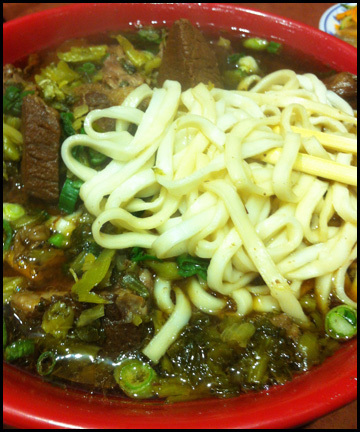 With these expectations, I decided to try the Taiwanese Beef Noodles (TBN) from Lao Shan Dong in the Metrotown area. They seem to be the standard-bearer for TBN in the area as I have seen positive recommendations for the eatery. I ordered the large braised beef flank with noodle in soup, not spicy. Lao Shan Dong is very generous with the portion of food they serve. The large size is a mountain of food. However, quantity does make up for the lack of quality. The plentiful chunk of beef flank was not seasoned and some were tough and chewy. I applaud their no MSG policy however it might of helped if it had some. The soup was bland. It had no flavour, didn’t really taste like a beef both and was a bit too oily. As a result the large volume of noodles, although cooked perfectly, had nothing to help boost its tastiness since the soup was not very flavourful. With the weak soup, the large TBN I ordered was overwhelming. By the time I slurped my last noodle (not because it was delicious but because I don’t like wasting food) the soup had gone stone cold. I felt like I deserved a badge of honour for just completely eating all the noodles. If Lao Shan Dong was a Taiwanese eatery that served other dishes, I might not have bother even writing about the unappetizing TBN I had. However since it specializes in TBN, the noodle bowl was a fail. It needs to increase the beef flavour (more bones & meat simmered for longer period of time, perhaps) in its soup as soon as possible.